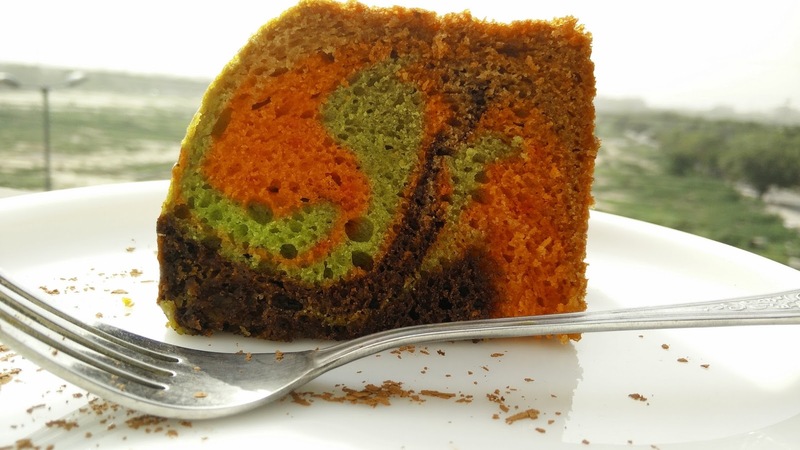 Soft, light and fluffy marble cake is best to have anytime, on the go or with tea. Marble cakes are always fun to make, experiment and tasty. This time I tried with cocoa powder, red and green color. My kido’s favorite…. 1. Sieve flour, baking soda, baking powder at-least 3-4 times so that it becomes light and air gets entrapped in dry ingredients. 2. Empty the can of condensed milk in a bowl and add ghee/oil in it. Add the flour in this mixture to make smooth cake batter. 3. Divide the batter in sections and add all different colors in each section. 4. Take a greased baking tin, first pour the white or the basic batter, then pour the colored batters in layers and randomly move the fork in the batter to create different pattern. 5. Preheat oven at 180 degrees and put the cake for baking for at-least 45 min to 60 min. Once baked, allow it to cool. Once completely cool cut pcs and serve.